View and download the Ocutech Bioptic Telescope Prescribing Worksheet and watch the Ocutech Bioptic Prescribing Worksheet Webinar. The Bioptic Prescribing Protocol is divided into two parts—Hard Signs, those that can be measured or otherwise determined, and Soft Signs, those that are judgments and are developed through patient interaction. Best corrected visual acuity through conventional lenses is in the 20/70 to 20/300 range. While 20/40 is the suggested acuity goal while looking through a bioptic (20/30 for demanding discrimination tasks) acuity should be at least 20/50 to be of functional gain to the user. Since bioptic telescopes are most well accepted in powers up to 6x, acuity of 20/300 (20/50 x 6) is usually the upper limit of an effective telescope prescription. While higher power bioptics are available their utility and benefit to the patient become less effective. • Goal: The patient should be able to read fluently to at least the 20/50 line while looking through the telescope. Able to see facial features while looking through the telescope at a distance of 12 feet under normal room illumination. All telescopes reduce retinal illumination and contrast. Testing visual acuity through a telescope using a conventional high-contrast eye chart is not an appropriate assessment of how the telescope is likely to be used in day-to-day applications. Since most visual activities require low contrast visibility, and that seeing faces is a common goal of telescope devices, using a face as a low contrast test target is an effective and convenient way to determine the patient’s functional response to telescope magnification. • Goal: The patient must report that they can see the face much better through the telescope. If they report that the face is larger but NOT easier to see than the prognosis for telescope success is reduced. The better seeing eye is the dominant eye, OR, that while looking through the telescope the dominant eye sees better than the fellow eye. 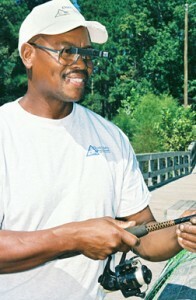 Most individuals find that sighting through a monocular telescope is much easier when using the dominant eye. 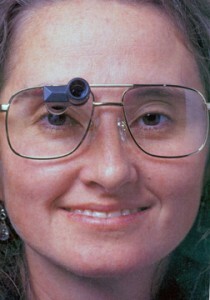 In fact, many individuals are unable to aim or sight through a telescope with the non dominant eye. As a result, the ability for the patient to localize through a bioptic telescope will be much more natural if they are using their dominant eye. An easy way to determine the dominant eye is to ask the patient to look through a handheld telescope without suggesting which eye to use. They will usually bring it to their dominant (preferred fixating eye) reflexively. If they ask which eye they should use, suggest they bring it to whichever eye seems more natural. On occasion, patients will show no ocular preference, and can sight equally well with either eye, however this is a rare exception. • Goal: The better seeing eye is the dominant eye. If the better seeing eye is not dominant, it is often desirable to prescribe a binocular system. Another approach, is to occlude the dominant eye while the patient is sighting through the bioptic using a sector occluder. Often computer users find a bioptic more convenient than using screen magnifiers or strong reading glasses. Telescopes are used for distance and midrange visual activities such as seeing faces, TV, the blackboard in school, computer screens, packages on shelves, signs while traveling, playing cards and board games, etc. If the patient’s functional goals do not relate to these types of activities, a bioptic telescope may not be an appropriate prescription. While bioptic telescopes can be used for reading, it is not usually considered a primary functional goal of the bioptic. • Goal: The patient has mid-range and beyond visual activity goals. Patients who show a natural skill and an intuitive familiarity with using the device will be more successful in their adaptation. Evaluation of such skills should be done out of the examining room and in an environment more akin to a normal setting. The patient should be allowed to walk wearing the demonstration device, look at assorted targets, and look in a mirror to appreciate their appearance with the device in place. It will usually be quite apparent whether the patient will adapt well to using the device. While therapy to learn to use the device can be helpful with adaptation, an individual who shows poor skills and visuo-motor integration difficulties with the device will be a less promising candidate. • Goal: The patient responds to the device favorably, can find targets while looking through the device, and improves with practice during the evaluation. No matter how natural it is for the patient to use the device, and no matter how well it enhances their vision, patients must be personally motivated to seek to improve their vision. They must be prepared to confront the challenges integrating such a device into their daily routine. Expectations must be tailored to each patient’s needs and habits. While some individuals might wear a bioptic for many hours every day, others may only need it for specific activities that occur much less frequently. Some individuals do not care to wear a device in public that is unusual in appearance, while others have no such concerns. The review of these psycho-social issues is an integral part of determining an adaptation prognosis. A minimum one-month adaptation period is recommended. • Goal: The patient is excited about how they are seeing with the bioptic and embrace the opportunity to improve their vision. In the final determination of an appropriate bioptic prescription, a combination of the hard and soft signs will create an overall prescribing prognosis that is appropriate for the individual patient. This systematic approach can be helpful to the clinician in advising the patient of the likelihood of their successful adaptation to bioptic telescope systems.